Every morning on my drive down Rucker Ave. I have followed the restoration of the historical old Hartley mansion. It is finally done. So it’s moving-in day for Dr. Sanford Wright, Everett physician and surgeon. The new sign “Everett Neurological Center” replaces the old one which read “Historical Restoration, Robert Butterfield and Associates, Architect, and Newland Construction Company Contractors. The old Hartley house has stood on this location for some 74 years. Started in February 1910, scheduled for completion in August of that year, it was finally finished and occupied in 1911. In recent years the house had become a nursing home for senior citizens, painted red, and hung with wooden fire escapes and ramps for the assistance and security of its occupants. It always made me a little sad to drive by. It seemed a poor end for such a lovely home. So I think we all owe a vote of appreciation to the young neurosurgeon for buying that old home for his clinic. And for the considerable expense he has given for its restoration. If you examine the accompanying photograph from the Everett Public Library you can see that the original railings on the first, second, and third floors have been painstakingly reproduced. The house has been painted the original white. The painting contractor Al Larson said there were many coats of various colored paint to cover. Roland Hartley, lumberman, mayor, legislator, and governor of this state had quite a thing about the paint on his house. He insisted on using white lead and linseed oil, which was an excellent preservative. He always used white. Wright has gone to a great deal of trouble on the inside of the house. Stripping and refining woodwork, sanding and doing the floors, and even replacing the beveled glass in some of the broken windows. It is all there now in its pristine beauty. Wright wanted a view of the sound and Everett harbor, and he has an excellent view from his upstairs office on the second floor in the southwest corner. 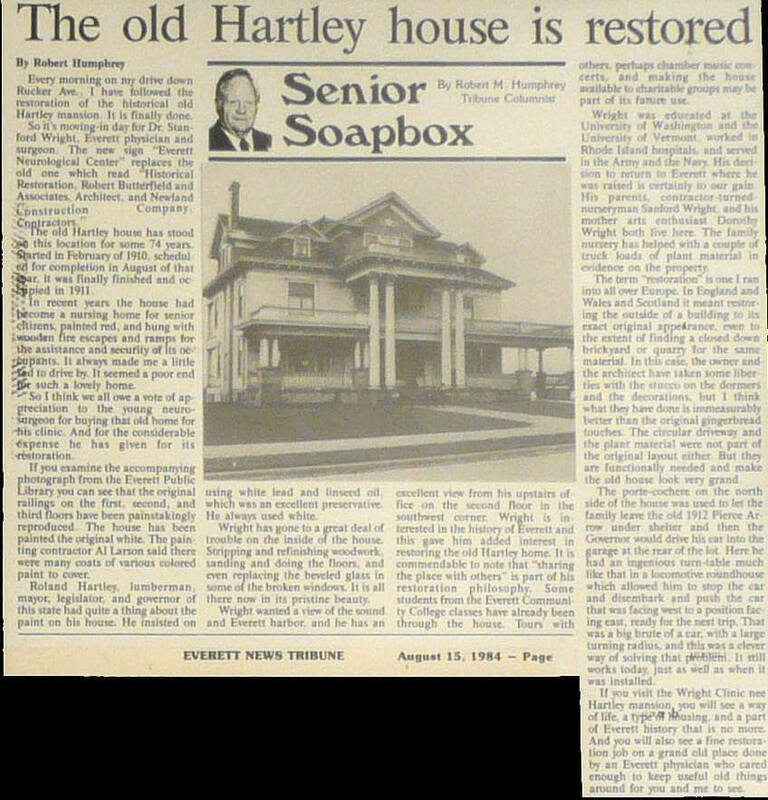 Wright is interested in the history of Everett and this gave him added interest in restoring the old Hartley home. It is commendable to note that “sharing this place with others” is part of his restoration philosophy. Some students from the Everett Community College classes have already been through the house. Tours with others, perhaps chamber music concerts, and making the house available to charitable groups may be part of its future use. Wright was educated at the University of Washington and the University of Vermont, worked in Rhode Island hospitals, and served in the Army and the Navy. His descision to return to Everett where he was raised was certainly to our gain. His parents, contractor-turned-nurseryman Sanford Wright, and his mother art enthusiast Dorothy Wright both live here. The family nursery has helped with a couple of truck loads of plant material in evidence on the property. The term “restoration” is one I ran into all over Europe. In England and Wales and Scotland it meant restoring the outside of a building to its exact original appearance, even to the extent of finding a closed down brickyard or quarry for the same material. In this case, the owner and the architect have taken some liberties with the stucco on the dormers and the decorations, but I think what they have done is immeasurably better than the original gingerbread touches. The circular driveway and the plant material were not part of the original layout either. But they are functionally needed and make the old house look very grand. The porte-cochere on the north side of the house was used to let the family leave the old 1912 Fierce Arrow under shelter and then the Governor would drive his car into the garage at the rear of the lot. Here he had an ingenious turn-table much like that in a locomotive roundhouse which allowed him to stop the car and disembark and push the car that was facing west to a position facing east, ready for the next trip. That was a big brute of a car, with a large turning radius, and this was a clever way of solving that problem. It still works today, just as well as when it was installed. If you visit the Wright Clinic new Hartley mansion you will see a way of life, a type of housing, and a part of Everett history that is no more. And you will also see a fine restoration job on a grand old place done by an Everett physician who cared enough to keep useful old things around for you and me to see.